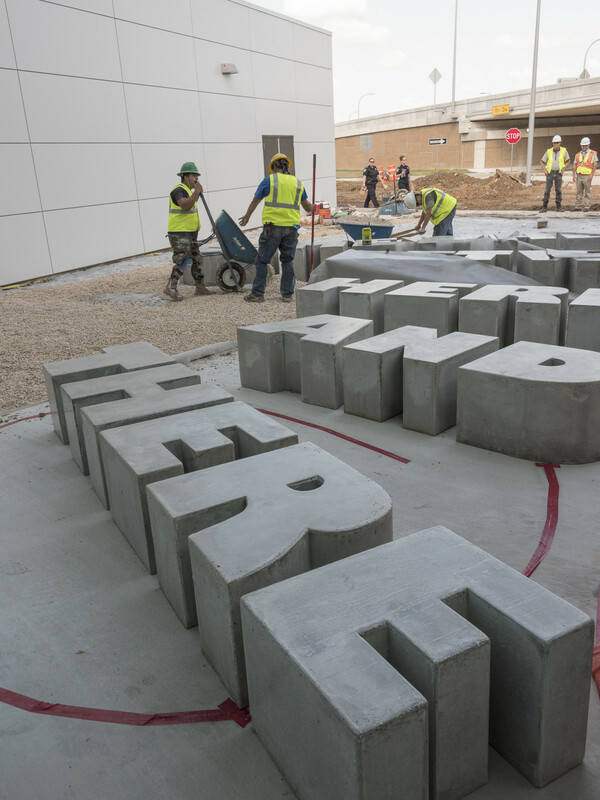 Travelers at the new international terminal at William P. Hobby Airport, which opens Thursday (October 15), who don't have time to visit a museum in Houston can get an idea of the area's varied and interesting art scene just by looking around. Six new large scale works of art have been installed in the new terminal, with a seventh on the way in an adjoining common space. 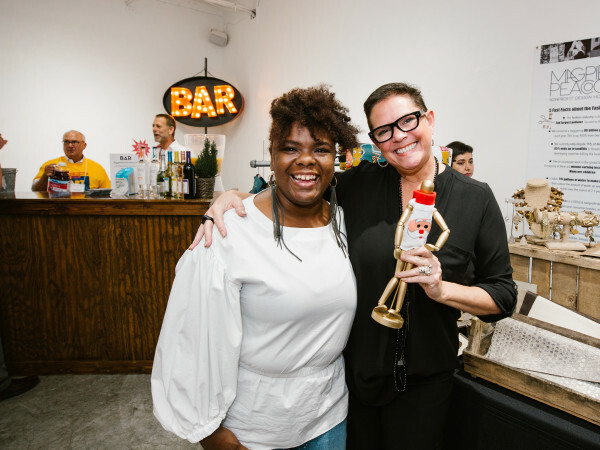 Southwest Airlines and the Houston Arts Alliance are funding the art through the "Percent for Art" ordinance, which mandates that 1.75 percent of funds for capital improvement projects go for new artwork. 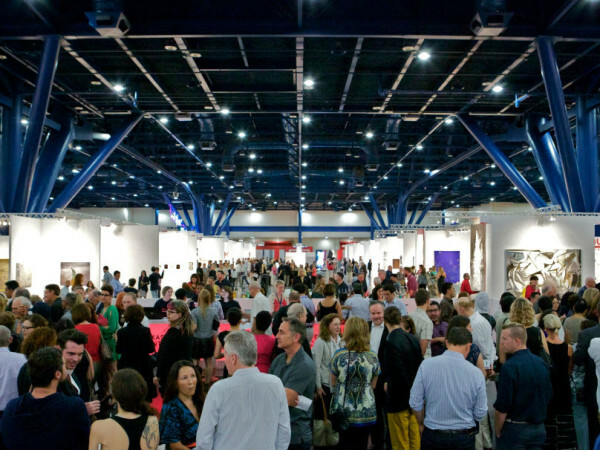 The total amount of new artwork at Hobby is $1.6 million. 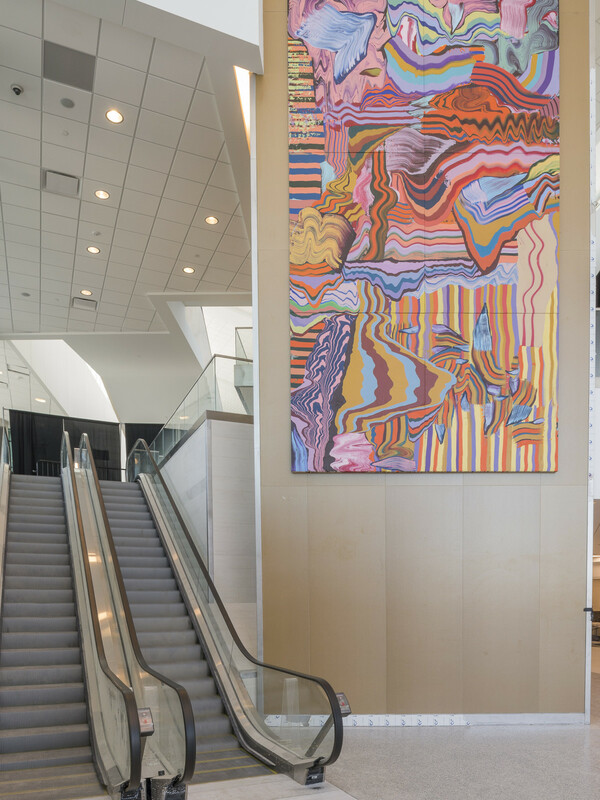 Houston artists Libbie J. Masterson, Krista Birnbaum, Norman Lee and Shane Allbritton, along with Kia Neill, a former Houston artist who now lives in Denver, have joined San Antonio artists Chris Sauter and acclaimed artists Christian Eckart and Henrique Oliveria to create individual pieces in the new terminal. Here's a close-up look at their work. 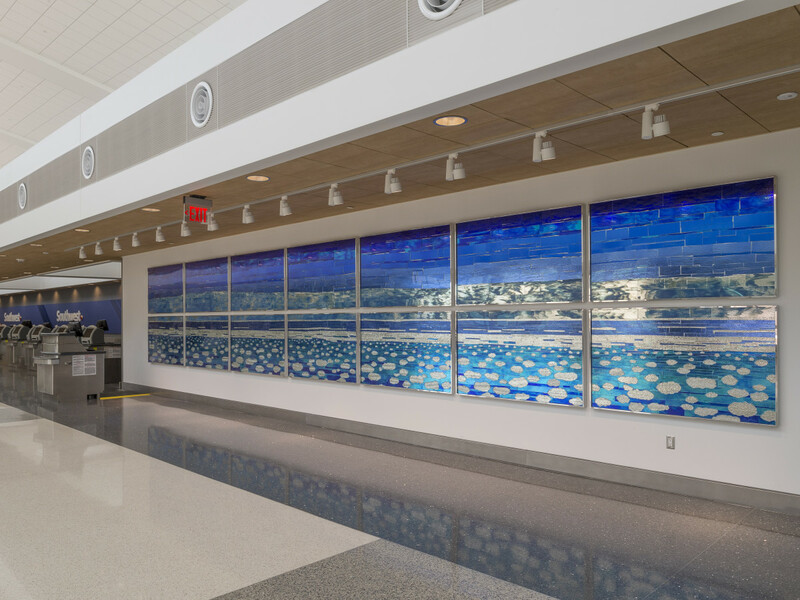 Shown above: Libbie J. Masterson's Ethereal Sky greets travelers near the Southwest check-in area in the international concourse. She based the work on scenes from an airplane window while in flight. The artwork, which measures 6-feet, 6-inches high and stretches 35 feet long, is made of Plexiglass panels that can be touched. 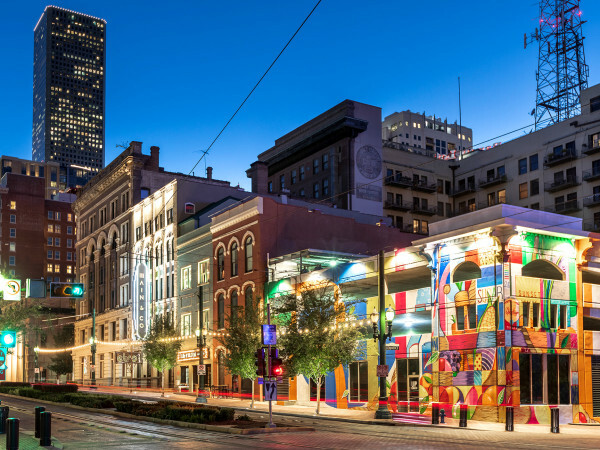 "It's a pretty maintenance-free piece, which is perfect for public art," says Houston Airports Public Art Program Curator Tommy Gregory. At the main entrance of the international concourse area, where people can wait for their friends or family to come out of Customs, a large piece by Brazilian artist Henrique Oliveira called Travessia dominates a wall near the escalators. The piece, which measures nearly 20 feet by 11 feet, is acrylic on linen. Many passengers arriving in Houston are expected to be from Mexico and Latin America, since Southwest will be flying between several destinations in the region and Hobby. The painting is located near a CultureMap storefront and Pete's Coffee. While waiting for passengers, anyone can freely access the outdoor sculpture, Airport Seating, by Chris Sauter. 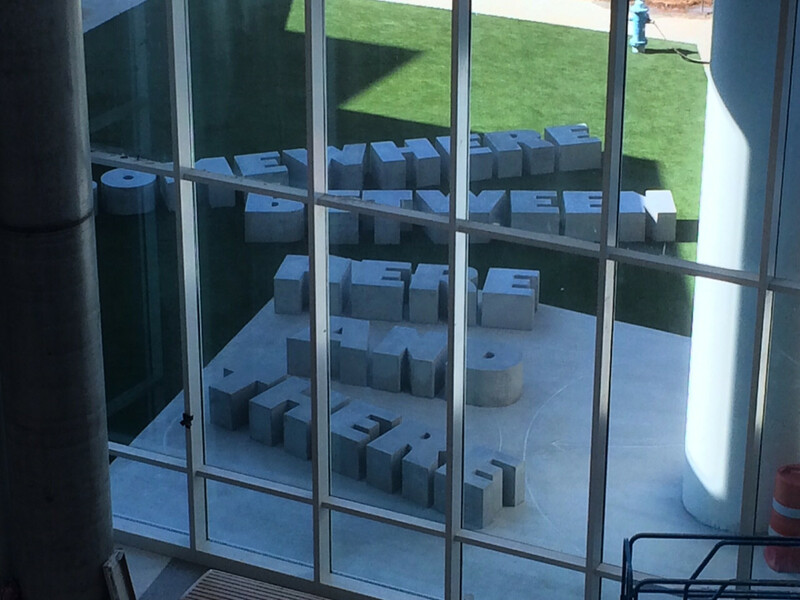 It consists of concrete blocks that spell out "Somewhere Between Here And There." The art is meant to be interactive, as the public can sit or stand on the sculpture. A view of Chris Sauter's Airport Seating from atop a set of escalators that takes airport visitors downstairs in the new Hobby Airport international terminal. 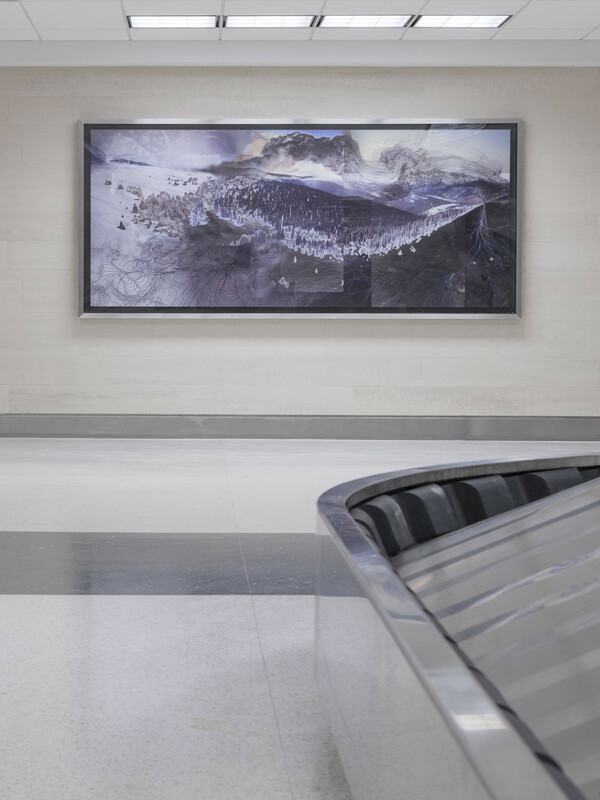 When passengers retrieve their baggage, they will be met by two works of art, including Language of Evolving Trails, by Kia Neill. It is a fascinating digital collage of photography, drawing and painting. The archival aluminum print measures 4 feet by 10 feet framed. 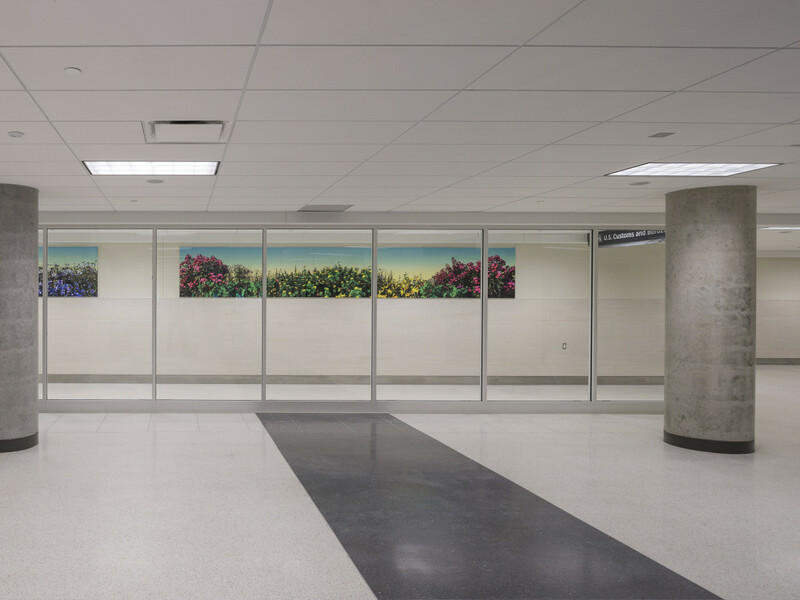 The work of RE:site Studio founders Shane Allbritton and Norman Lee dominates one wall in the baggage claim area. 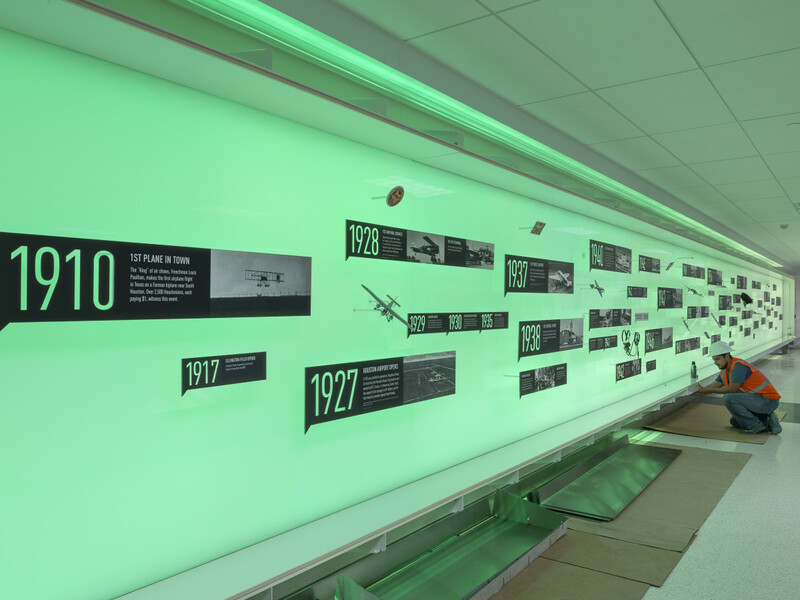 Time in Motion presents a visual history of Hobby Airport from 1910 to the present. From a distance, the sweeping light sculpture, measuring 7 feet high and 23 feet long, seems blurry but comes into focus as a viewer approaches it, evoking the idea of how air travel is a metaphor for "how we move together in a modern world, individually and yet together," according to an explanation near the artwork. It is said to be a favorite of workers at Hobby Airport. 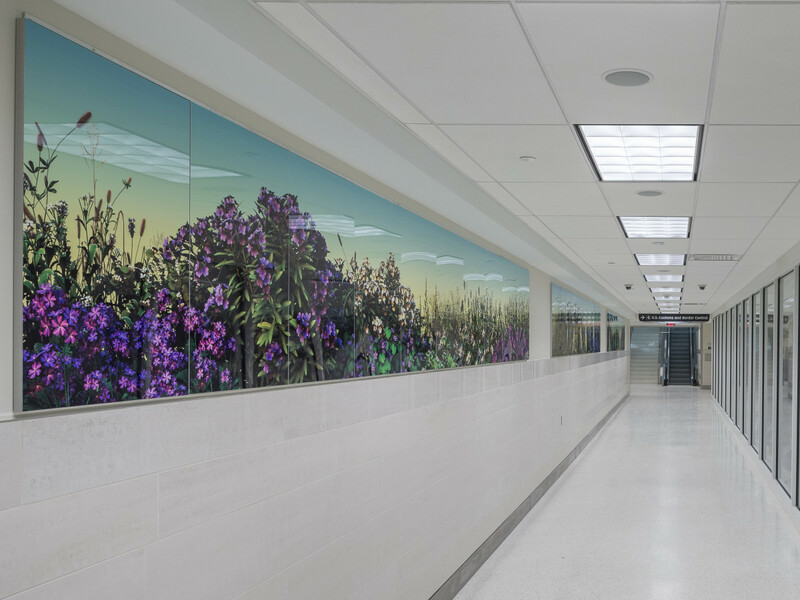 On a long wall as passengers wait to go through Customs, Krista Birnbaum's Roadside Attraction provides a splash of color and a reminder that you're back in Texas, with native plants slipped in among the flowers on the side of what may be a long highway. "We needed color in this area. It looked like an institution," Gregory says. "She was an awesome problem solver." In three sections totaling 20 feet long and 3 feet high, Roadside Attraction is inkjet print on aluminum panels. Artist Krista Birnbaum created the work digitally and blew up each panel to the large sizes. 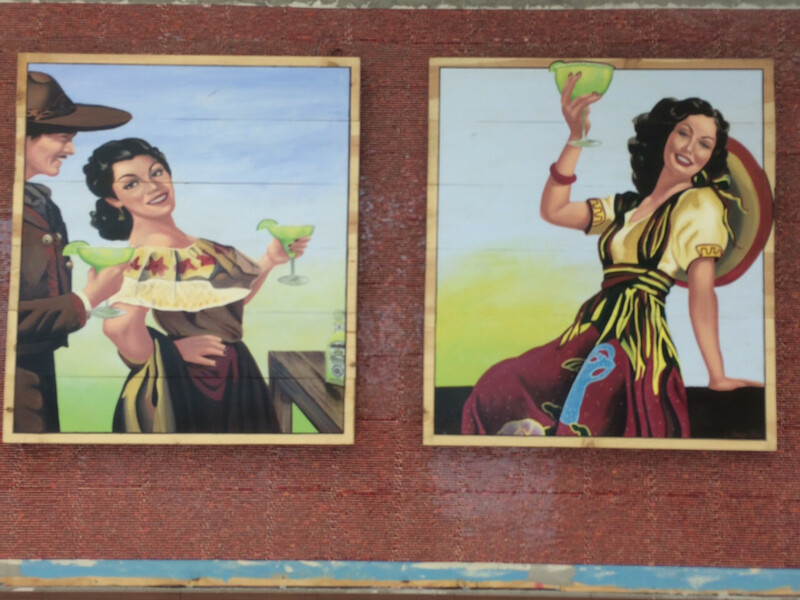 Not part of the airport art project but nevertheless a welcome respite for travelers at the new international terminal at Hobby Airport: The exterior of a new Pappasito's restaurant offers enticing artwork — and encouragement to drink up!